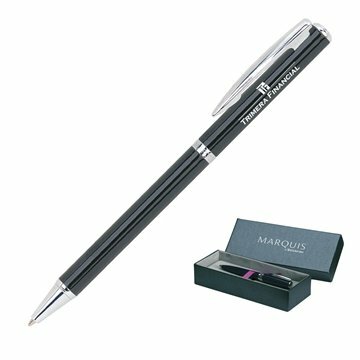 Twist-action slender ballpoint pen with a black lacquer finish over a solid brass core. Arcadia II® writing instruments offers an alternative for those seeking a slimmer writing instrument. When I order anything else, I will be contacting her. She should get a pat on the back for effort. Thank You. I like the functionality and practicality of this which added more value to an already very affordable price. Used these as a gift to our new clients. I agree with the above suggestions. We will order more product. I liked that it's what we needed for our Stroke forum. We liked that logo. I cannot think of anything I didn't like about my experience.Products came exactly as promised.